Similar to that group, these birds have gathered prior to a hunt albeit an evening hunt instead of a dawn foray. However, the Strigiformes gathered here have a different group system. Not only do they have different rules to follow, but they don't mess around with sho-who-whoing outsiders away. Imposters are torn to shreds and fed to the hawks as payment for staying out of the owls' hunting area. Sadly, this has not led to increased security. This group has two outsiders in their midst. Can you identify the two owls behaving anti-socially (I.E. not following the parliament rules) in the image below? What is the rule? A valid answer must contain the parliament rule and why those particular owls are not following it. The puzzle can be solved with a black-and-white printout of the image. Note 1: In the column labels, I skipped the letter I on purpose to avoid confusion with the number 1. It is not a clue. Note 2: BmyGuest found a valid pattern that I missed. The owls he found are, in fact, the odd birds out. I have since changed those two bird eyes such that they are still outside the intended pattern but no longer fall under the pattern BmyGuest found. I have delivered +1 to that answer nonetheless. I added a row of owls simply because I liked how the pattern broke there. It doesn't really matter how many owls there are. The pattern holds up for any positive natural number of owls. Therefore, they must be following a pattern or series. There are 64 possible eye pairs. Only 30 are valid and only 18 are used in the picture. The pattern is semaphore. 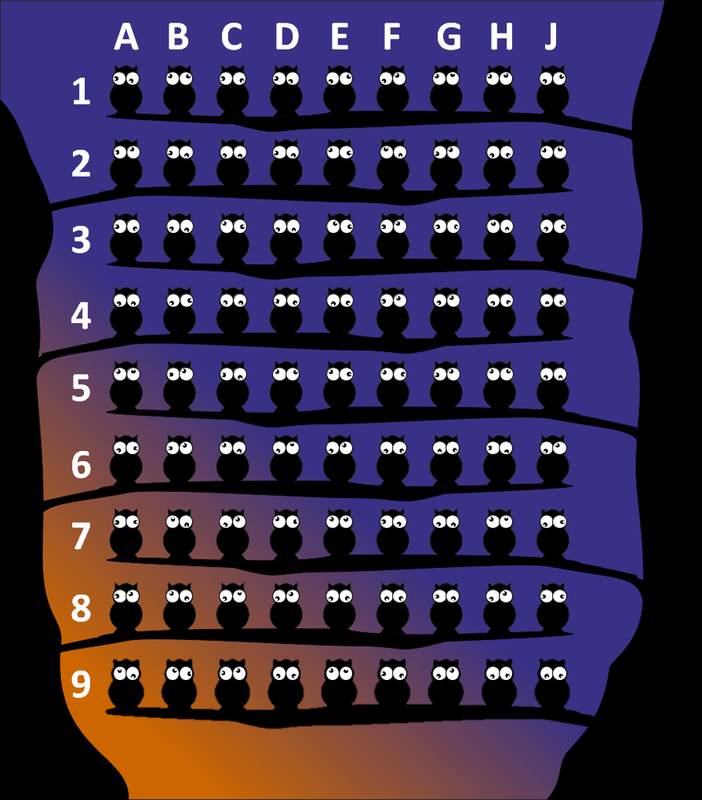 Use the directions of each owl's eyes as the positions of the flags. These are the lyrics to the lullaby "Hush Little Baby". A2 and D7 are the wrong letters. A2 should have looked south, northeast, and D7 should have looked south, east. The answer below was valid prior the image-edit. It does no longer apply. These two owls are the only ones with a unique eye combination. All others copy at least one other owl. I'm still struggling to see this, but I want to get some momentum into this puzzle, so as work in progress I'm summarizing some ideas. The pattern does not rely on the fact, that it's a 9 x 9 grid or a total of 81 owls. Occurring combos appear between 2 and 9 times and the histogram is not very distinctive. 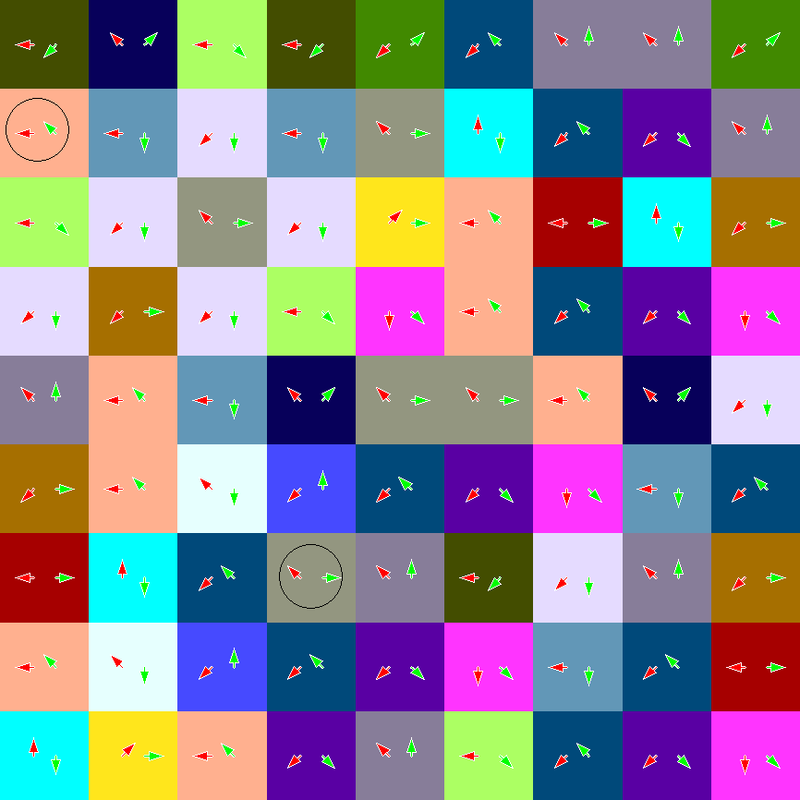 It is maybe easier to analyse the image by taking out the owls and representing unique eye-pairs by a single colour. - The fact that the "wrong" owls were replaced without altering the other pattern, or indeed the fact that the patterns exists with some mistakes in it, lets one assume that the pattern does not depend on the other owls, except the dependency is such, that both incorrect owls depend only on each other and no other depends on them. This rules out things like "left neighbour" or "sum of the row" etc. - The fact that there are invalid combos needs analysing. What logic reason can reduce 64 --> 30 ? Some non-decimal number system maybe? - Is it a 2D or just a 1D pattern? If 1D, what is the "sequence" order? left-right or up-down? - Are all owls determined by a rule, or is there a "seeding" owl which defines the pattern. From the storyline, all owls should "independently" be able to match a pattern. - It is intriguing that - if you just read the lines left-right and continue to the next line - you find some of the patterns repeat themselves. This is most noticeable in the blue-purple-pink sections. Sometime patterns repeat for longer than others, but I can not think why exactly they break differently. Obviously it has to do with "other owls", but how? the ones at (1,1) and (0,2) where the bottom left one is (0,0)? They're the only ones looking at each other directly. an owl may only make eye contact with at most one other owl. Owls are making eye contact if they are looking in each others direction with at least one eye and there are no other owls between them. b9 and c9 who are looking at each other as well as c9 and b8 who are looking back at them.